The research and thorough study of organizational theory is significant for practical contemplation. There are several theoretical approaches in organization processes. In classical theory of organizational process, main emphasis is on structural factors and functions or activities to attain the objectives. Theorists stated that focus is given on specialisation and co-ordination, and chain of command facilitates co-ordination and communication. Classical theory to management is a set of consistent ideas on the management of organizations that developed in the late 19th century and early 20th century. This viewpoint appeared from the industrial rebellion and centres on theories of efficiency. As at the end of the 19th century, when factory production became persistent and there were large scale organizations, employers and other business groups explored ways to encourage employees and augment output. Main contributors who evolved classical approach to organizational processes are Frederick Taylor Henri Fayol. Most of them developed fundamental concepts for a comprehensive theory of management (Mullins, 2015). These theorists generated management theories such as Taylor’s Scientific Management, Fayol’s Administrative Management and Weber’s Bureaucratic management (George, 1948). Frederick Taylor (1917) developed scientific management theory that is known as Taylorism at the beginning of this century. His theory had four basic principles. Scalar and functional processes such as unity of command, chain of command, delegation of authority, defining responsibility and accountability. In the beginning, Taylor got success at improving production. His methods involved getting the best equipment and people, and then carefully scrutinizing each component of the production process. By analysing each task independently, Taylor explored the right combinations of factors that helped to increase in production. Though, Taylor's scientific management theory was unbeaten in industrialized companies at end of the century, but could not perform well in modern companies. The beliefs of "production first, people second" has left an inheritance of declining production and quality, displeasure with work, loss of pride in workmanship, and a loss of organizational pride. Henri Fayol was also major contributor of Classical Theory. Henri Fayol has dissimilar viewpoint than Taylor and he focused on the manager rather than the worker and he emphasized in administrative features in the organization. Fayol established five administrative functions: (1) Planning; (2) organizing; (3) commanding; (4) coordinating; (5) controlling. These aspects indicate that Fayol concerned in commanding and controlling the organization towards high performance. Furthermore, another contributor for classical approach is Max Webber, a German sociologist, who evolved the thought of bureaucracy. Max Weber (1947) developed on Taylor's theories, and emphasized the need to decrease diversity and vagueness in organizations. There was more focus on establishing clear authority and control. Bureaucratic approach of Weber emphasized the need for a hierarchical structure of power. It documented the importance of division of labour and specialization. A formal set of rules was bound into the hierarchy structure to insure stability and uniformity. Weber also put forth the notion that organizational behaviour is a system of human interactions, where all behaviour could be understood by looking at cause and effect. 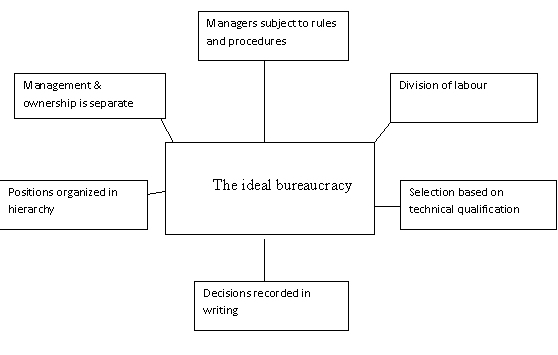 Weber believed the bureaucratic notion was an approach to reduce the frustrations and illogicality of big organization where the relationship between management level and workers are based on class privilege (Owens, 1987). The Classical Approach of organization behaviour was best suited in the early 1900’s when the main issues in companies were related to the rising number of employee, increasing demand, full of mechanisation, and the tasks rationalisation in every jobs (Terry, 1975). The classical theory has appropriate insight into the nature of the organisation. The theory focuses on the structure of formal organisation neglecting the interaction of individual personality, informal or social groups and intra-organisational conflicts. The classical theory (Theory X) views organisation as a structure which centres around work and not on persons. The classical approach supposed to be an authoritarian and autocratic managerial style. This approach ignores human behaviour and human relation. There is an absence of rapid and free channels of communication, discounting innovation, initiative and change. It has been observed that classical theory of organization design is lacks in flexibility and adaptability. There is tight control through force and coercion. In this approach, there is an absence of intrinsic rewards. Classical management theory was rigid and mechanistic. The limitations of classical organization theory rapidly became apparent. Its major insufficiency was that it tried to explain peoples' enthusiasm to work strictly as a function of economic reward. The Neo-classical Approach: The dogmas of neoclassical theory developed with human-oriented approach and main focus was on time needs, drives, behaviours and attitudes of individuals (Singh, 1983). The neoclassical approaches recognize early classical frameworks but expand and made significant qualification of them. The neoclassical theory integrates the behavioural sciences into management thought in order to solve the problems caused by classical theory practices. The principle of this enclosure was based on the idea that the role of management is to use employees to perform business functions in organizations. Instead of concentrating on production, structures, or technology, the neoclassical theory was mainly associated with the employee. Neoclassical theorists focused on replying questions related to the best way to motivate, structure, and support employees within the organization. It was believed that any manager who failed to account for the social needs of his or her employees could expect to deal with resistance and lower performance. Employees needed to find some inherent value in their jobs, which they certainly were not getting from the job that was highly standardized. 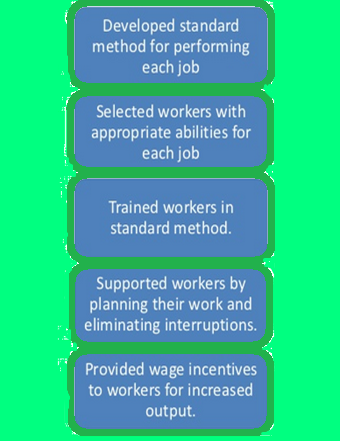 In this approach, workers are structured in such a way that they would regularly share tasks, information, and knowledge with one another instead of placing employees into job roles, where they completed one particular task all day with little to no interaction with fellow workers. The principle was that once workers were placed into this alternate structure, their needs for socialization would be fulfilled, and thus they would be more creative. There are two major groups such as human relations school and behavioural schools emerged during 1920s and 1930s that developed the neoclassical theory. This approach reflects human relations movement as well as behavioural science approach. It thoroughly studies motives, supervision, group and intergroup behaviours. It is designated that effective co-ordination of activities is not possible without the collaboration of people. This theory transmits people-oriented organisational structure which will incorporate informal and formal organisations. Two concepts of Theory-Y approach are individual and work group i.e. inter personal relations and need for two way communication in the organisation demanded special attention in developing humanised organisational structure. Contributions: Neo classical approach emphasised the role of informal organisations as agencies of social change (Informal Leadership). Neo classical theory developed motivational theory and theory of co-ordination and leadership. The Neoclassical approach basically evolved with the Hawthorne studies in the 1920s. Studies during this time, including the popular Hawthorne Studies, showed that social factors, such as employee relationships, were an important factor for managers to consider. It developed to overcome the limitations of the classical theory. 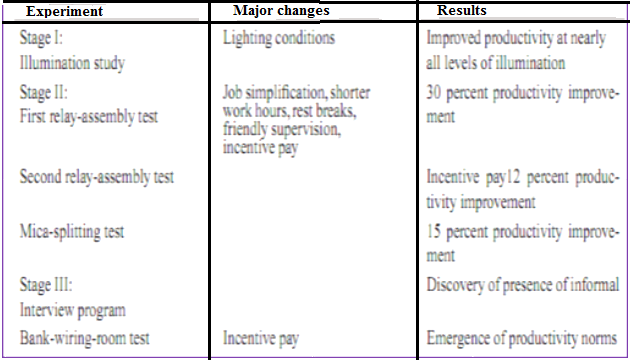 A three-stage series of experiments assessed the effects of varying physical conditions and management practices on workplace efficiency. The first experiment scrutinized the effects of workplace lighting on productivity. It produced the unanticipated findings that changes in lighting had little effect but that changes in social conditions seemed to explain significant increases in group productivity. Other experiments were also performed and the researchers concluded that social factors in particular, workers’ desires to satisfy needs for companionship and support at work-explained the results observed across all of the Hawthorne studies. Classical and neoclassical approach of organization made exceptional contribution to the development of management thought. In classical approach, attention was more on jobs and machines. In neoclassical, emphasis was on increasing production through an understanding of people. Many proponents of this theory stated that if managers understand their people and adjust their organizations to them, then organization will succeed. However, the classical theory focuses on task and structure while the neoclassical theory emphasizes people aspect. The contingency theory: Classical and neoclassical theorists analysed conflict as a factor that must be avoided because it hinder with stability. According to contingency theorists, conflict is inescapable, but manageable. The contingency theory of organizational structure currently offers a major structure for the study of organizational design (Donaldson, 1995a, 2001). It states that the most effective organizational structural design is where the structure fits the contingencies. It has provided logical concept for analysis of structure of organization. Main theoretical principles of contingency theory are that best practices depend on the contingencies of the situation. Theorists attempt to identify and measure the conditions under which things will likely occur. Since human service practice varies substantially, contingency theory provides a practical approach to model. The term contingency as used in contingency theory is alike to its use in direct practice. A contingency is an association between two phenomena. If one phenomenon exists, then a conclusion can be drawn about another phenomenon. Theorists explained that this theory indicates, the most suitable organizational structure depends not only on the organizational objectives but also on the situation, which includes the environment, the technology employed, the rate and pace of change, the managerial style, the size of the organization, and other dynamic forces. This approach is derived from the leadership and organizational structures. Numerous contingency approaches were devised concurrently in the late 1960s. 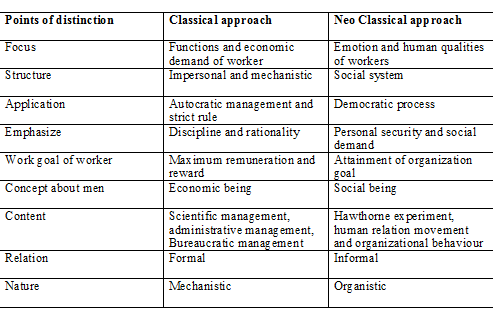 This approach emerged due to many drawbacks of the classical theories such as Weber's bureaucracy (Weber, 1946) and Taylor's scientific management (Taylor, 1911) which were not fruitful as they ignored that management style and organizational structure were influenced by various aspects of the environment, the contingency factors. The contingency approach initiated by Joan Woodward (1958), who declared that winning organizations in different industries with different technologies were characterized by different organizational structures. Contingency theory tries to relate research on many management variables. It allows executives to analyse a situation and find out what variables influence the decision with which they are concerned. Chandler (1962) proposed that an organization would obviously develop to satisfy the needs of its strategy that form follows function. Chandler stated that organizations would act in a rational, chronological, and linear manner to adjust to changes in the environment. Efficiency was a function of management's capability to adapt to environmental changes. Lawrence and Lorsch (1969) also explored how organizations adjusted to fit their environment. In highly unstable industries, they observed the importance of giving managers at all levels the authority to make decisions over their domain. Managers would be free to make decisions contingent on the current situation. The advantage of contingency approach is that it motivates managers to investigate individual and situational differences before deciding on a course of action. Major shortcoming of this approach is that it is often used as an excused for not gaining formal knowledge about management. The contingency perspective describes that the efficiency of various managerial practices, styles, techniques, and functions will differ according to the particular circumstances of the situation. To summarize, Classical and neoclassical approaches has major contribution in the development of organizational processes. Rapid economic development and industrial expansion of different nations, classical and neoclassical theorists who developed different techniques of production allowed every nation to be involved in global market. 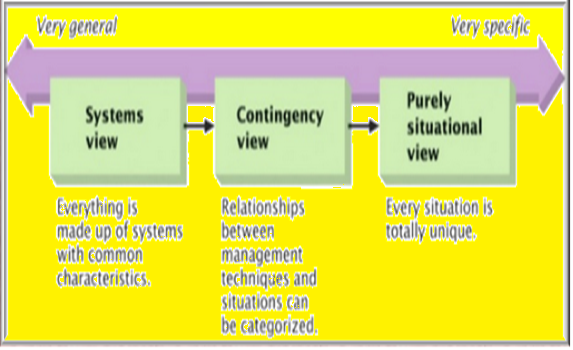 The contingency view is totally different than doing the formal schools of management. The classical, behavioural, and management science schools assumed a universal approach. They projected the discovery of ‘one-best-way’ management principles that applies to every organization. However, experienced managers identify that not all people and situations should be handled identically. Therefore, the contingency approach developed theory that universal solutions and principles cannot be applied to organizations. The contingency theory proposes that what managers do in practice depends on, or is contingent upon, a given set of circumstances. Basically, contingency view stresses on situational appropriateness rather than universal principles.